It started, perhaps, with a bit of opportunism. In 1947, James A. Wooten, an experienced air cargo executive, got hired to turn around scrappy Alaska Airlines. The airline was $350,000 in debt, but it counted among its assets a newly acquired fleet of war-surplus aircraft (Douglas C-47s, a.k.a. DC-3s, and C-54s, a.k.a. DC-4s). These planes had been de-commissioned after WWII and the War Assets Administration was selling them for a song. Wooten added more aircraft to this fleet and went in search of profitable business with which to keep it busy. He proved successful in snagging contracts for the airline to carry freight and operate charters around the world. Perhaps it also started with a sincere desire to “do the right thing”—one of Wooten’s catchphrases. Wooten was a lifelong Baptist. During his tenure, Alaska charters participated in the Berlin Airlift of 1948, running critical supplies into blockaded West Berlin—and, reportedly, ferrying German brides of U.S. soldiers out. The airline also helped extract thousands of Holocaust refugees from Shanghai’s Jewish Ghetto as the Communists took over the city—where 20,000 Jews had taken refuge from Hitler, the most of any single city—and carried them to Israel. Enter an organization called the American Joint Distribution Committee with a pressing need. It was late 1948. In the wake of the formation of the Nation of Israel, anti-Jewish fervor ran rampant through the Arab world. 55,000 Jewish residents of Yemen were threatened by pogroms which had already claimed 80 lives. 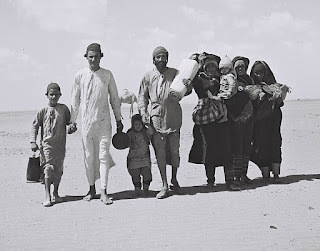 Nomadic Jews had lived in Yemen for centuries as dhimmis, despised non-Muslims subject to heavy fines, contempt and persecution. In the decades following World War I, religious persecution increased. Yemeni Jews were not allowed to walk on pavements. They could not testify against a Muslim in court. Jewish orphans were forcibly converted to Islam. Despite all this, for centuries they had continued to observe the faith of their fathers. The Israeli government was seeking a contractor who could airlift them to safety in Israel. Thousands of Yemeni Jewish refugees left the nomadic life they knew and walked hundreds of miles through the desert in order to reach the point of embarkation--a transit camp the JDC had set up in the neighboring British Protectorate of Aden. By the time they got there, they were in desperate straits. 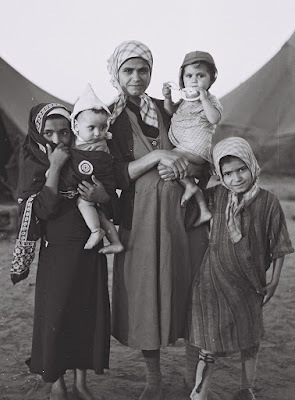 A very young Yeminite Jewish mother with her children, at the transit camp in Aden. Source: Wikimedia. They had no luggage. Most of them didn’t even have shoes.... They walked barefoot through the desert to get here. 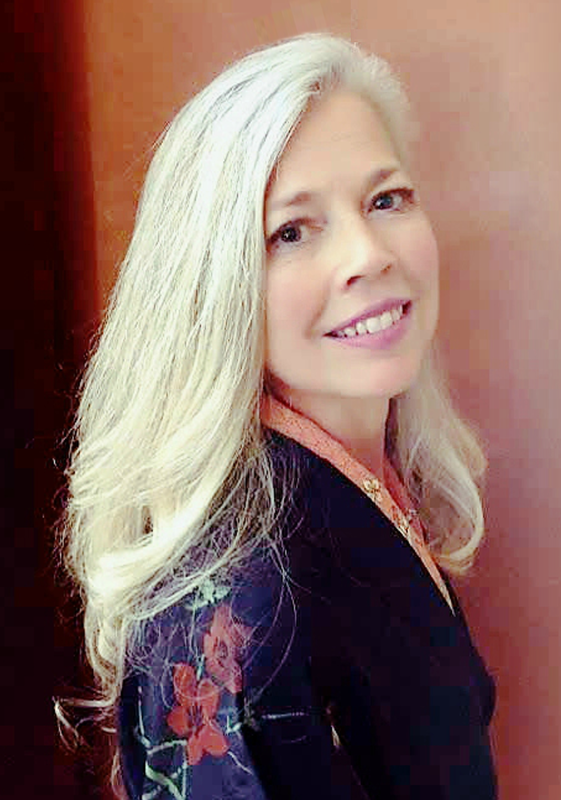 Some came from Sana’a,  miles away,” Long said. At the transit camp many of these nomads had their first experiences with electricity, medicines, running water and toilets. 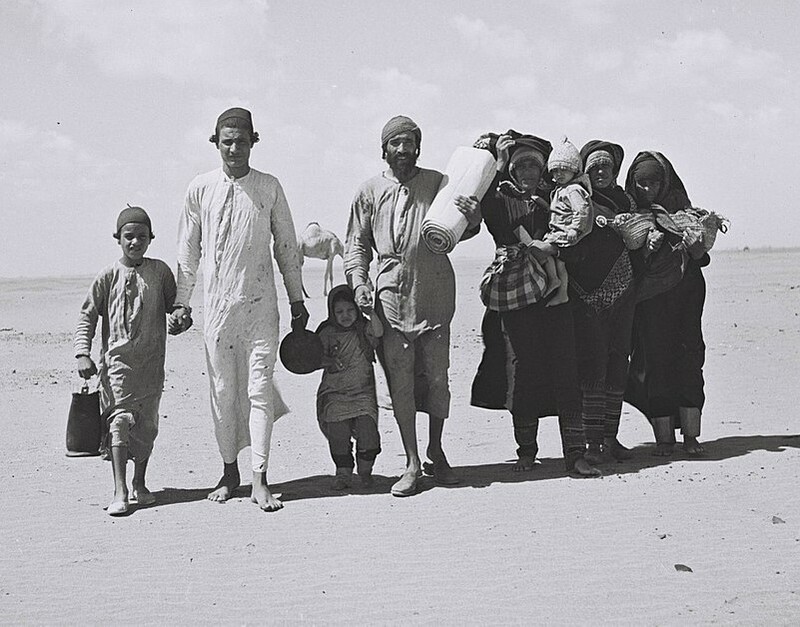 A Yemenite Jewish family crosses open desert to reach the transit camp at Aden. Source: Wikimedia. It was clear the situation was dire. The Yeminis needed to be moved without delay. Resourceful flight crews stripped the planes of their seats and installed benches to increase their capacity from 60 to 150 passengers per flight—no seatbelts. Extra fuel was carried in fuel tanks installed in the aisle between the benches. ...and many other Biblical prophecies that the Lord would someday regather the Jewish people to their land. The rabbis assured the people the gentiles from America were there to carry them to Israel on eagle's wings, just as the Lord had promised. “This,” the rabbis told the people, “is your eagle.” The airline painted an eagle with outstretched wings above the doors of the aircraft to reinforce the message. 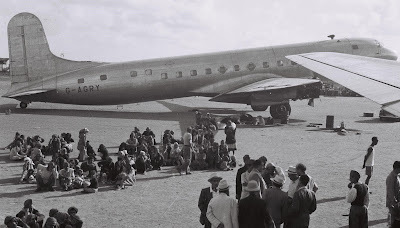 Yemeni Jews wait to board a plane at the airstrip at Aden. The work was arduous. The flight crews toiled twenty hours a day. The daily route began in Asmara, Eritrea, where Alaska was able to purchase fuel from the British. Then to Aden to pick up the passengers. Then up the Red Sea and the Golf of Aqaba to Tel Aviv. The journey from Aden to Israel was 1400 miles long, mostly over hostile territory. They couldn’t leave the planes in Tel Aviv overnight for fear of enemy bombing, so they would fly on to Cyprus to catch a few hours’ rest before repeating the route the next day. The work was also dangerous. Alaska’s planes were targeted by Egyptian anti-aircraft fire. The desert sand was hard on the equipment, yet pilots were warned in strictest terms that an emergency landing in enemy territory was likely to cost the lives of all aboard. Chief Pilot Robert F. Maguire Jr. once had to make an emergency landing in Port Sudan, Egypt. The quick-witted Maguire requested that ambulances be brought immediately. “I have smallpox on board,” he told the Egyptians. The ruse worked. The Egyptians declined to board the plane and were quick to supply the needed fuel so the “infected” plane could be on its way. In a little more than a year, 380 flights evacuated 40,000 to 50,000 Yemenite Jews to new lives in Israel. While some aspects of the operation have engendered significant controversy, the role Alaska Airlines and its determined flight crews played has garnered nothing but praise. David Ben-Gurion nicknamed Robert Maguire the “Irish Moses” for his role in bringing Jewish refugees to the promised land. Thanks so much for sharing. I have never heard about this...so very interesting! What an amazing piece of history. Incredible! This was an informative history post. Thank you for sharing, Linda. Thank you so much for reading, Marilyn, and for taking time to drop a note. It's very much appreciated! I really enjoyed the history lesson here. Wonderful story of redemptive efforts through entrepreneurship. Reminds me of an aviary Oscar Schindler. Best wishes on your launch! Thank you so much, Kathleen! I appreciate the encouragement! Hi, HHH readers! Just dropping a line to let you know that Tess won my drawing for The Lost Castle by Kristy Cambron. Happy reading, Tess!